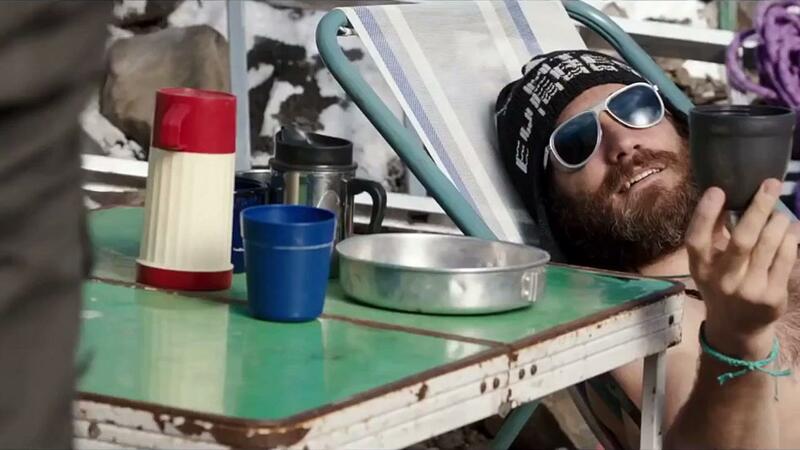 Last night I checked out Everest (2015) by Icelandic director Baltasar Kormákur. The high-altitude survival adventure came heavily recommended by my hulking colleague Philippe, a movie savant if anything, but somehow it had slipped through the cracks. No more! Watching it a my sister's place yesterday, I found myself constantly gasping for air, almost as if I was climbing the Everest myself. The sweeping vistas, beautiful aerial photography and visually stunning imagery provide one of those rare immersive experiences definitely worth your time. 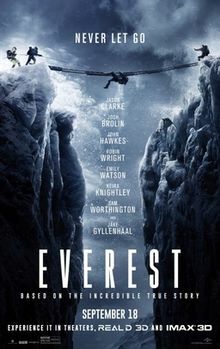 Everest is based on the real events of the 1996 Mount Everest disaster, when eight people got caught in a blizzard during attempts to ascend or descend from the summit. Pour me another cup of Anti-Freeze? The year is 1996. Various commercial expeditions arrive at Mount Everest base camp to prepare for a climb to the summit. Robert Hall (Jason Clarke), the leader of Adventure Consultants, guides a versatile group of clients, including experienced climber Beck Weathers (Josh Brolin), former mailman Doug Hansen (John Hawkes) and climbing veteran Yasuko Namba (Naoko Mori). Worried about crowding on the mountain, Robert convinces Scott Fischer (a wonderful Jake Gyllenhaal), the chief guide for Mountain Madness, to work together to reduce delays. On their summit attempt, they are delayed over an hour, making the group miss the 2 PM turnaround, the latest safe time that will allow them to return to camp before nightfall. When it comes to sight, sound and technical achievements, Everest is as good as it gets. Its stunning visuals and epic scope deliver the Everest experience straight to the screen, making it seem like you're right there with Adventure Consultants, experiencing the cold and hardship. Then there's the A-list cast, starring Clarke, Brolin, Gyllenhaal, Keira Knightley, Robin Wright and others, doing the most they can with the material at hand. Where Kormakúr does a great job at inspiring awe and steering clear from Hollywood-ing the mountain, he falls short when it comes to character development and storytelling, making for a devastating 121-minute tour de force visually, but a very thin plot.